White Noise Creator lets you convert and professionally loop most audio files into White Noise Audio (WNA) files. White Noise Audio files can be opened in our White Noise mobile and desktop applications. Just provide a sound file, photo, and give it a name and the Creator software does the rest. 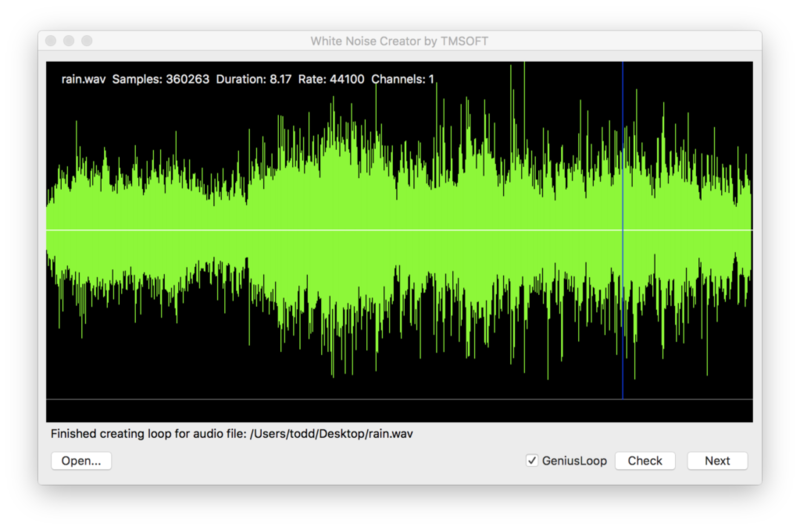 The resulting White Noise Audio file that can be opened with White Noise for iOS, Android, Mac, and Windows! Drag an Audio File into the sound window or use the File/Open menu to start the sound conversion and GeniusLoop process. Sounds created with White Noise Creator 4 require at least White Noise 6 for Android, iOS, or Mac and White Noise 4 for Windows. Audio will playback 2 seconds before the loop point so you can listen and review. Our unique GeniusLoop algorithm analyzes the sound data to create the perfect audio loop. If your original audio source is already looped or you don’t want the audio modified then uncheck the GeniusLoop option. Tap Next to add a photo, title, and description to your sound. It’s best to use a high resolution image that is at least 1024×1024. Move the photo focus point (red crosshairs) on the photo to a location you feel best represents the sound. For example, if it was a recording of a fan you would make sure the center of the fan had the focus point. The focus point helps when the photo is cropped so it can fit better on mobile screens. Add a short title, long title, and even longer description. The short title is used when mixing sounds together. The long title is displayed on the main screen of the White Noise application. You can also add an optional sound and image credit. Click Save to generate the WNA file to your desktop. White Noise Creator for Windows – Download WhiteNoiseCreator.zip and unzip all the contents into a new folder. Run setup.exe to install and then run White Noise Creator from the start menu.